A New Orleans lawyer who'd rather eat, drink, and swap stories than get caught in court, Tubby Dubonnet, cleaving faithfully to his guiding principles “Never screw a client and never lie to the judge,” manages, in his own laconic fashion, to right many of the wrongs that beset his clients. In these late-series books, he’s experiencing the pride and satisfaction of new grandparenthood. And he’s taken on some additional civic duties, agreeing to co-chair the reelection campaign of his good friend, Judge Hughes. But in Tony Dunbar’s books, New Orleans is The Big Sleazy squared. No one is safe, especially from their elected officials. Even if they are an elected official. Half the fun of a Tubby Dubonnet book is watching his sly creator fit together a plethora of fascinating yet seemingly unrelated jigsaw pieces to form a picture you never saw coming. And the other half is hanging out with Tubby and his crew of eccentrics, sleazeballs, goofballs, and enticing, confusing babes in the Big Easy-to-Love. The food descriptions are no slouch either. "I think he's going to shoot us once we're out in the Gulf," Tubby whispered to the girl. “His aura is green,” she agreed. WHO WILL LIKE THESE: Fans of Tremé, softshell crab po’ boys, Domilise’s, the Upperline Restaurant…wait, let’s start over, it's not all about the food—ok, fans of legal mysteries, (particularly Parnell Hall’s Steve Winslow series and anything by Lia Matera), comic mysteries, Elmore Leonard, funny lawyer movies like My Cousin Vinny, TV shows like Ally McBeal and Night Court; and everyone’s favorite New Orleans yarn, Confederacy of Dunces. It's a city of sin. And murder is only one of them. 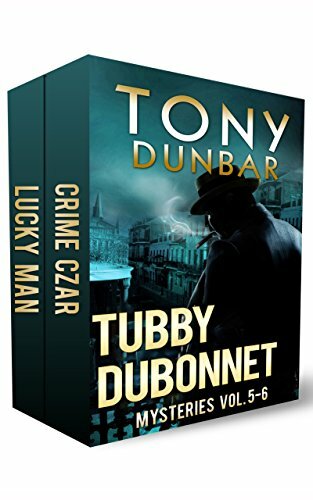 Tubby Dubonnet can't forget the last words that escaped an old friend's lips, and he can't get out of the way of a political campaign that's turning rough. Obsessed with the idea that a shadowy crime boss may be pulling the strings that have cost good people their lives, Tubby is entering into a test of courage with the most violent men in New Orleans. And if that weren't dangerous enough, he’s just picked up the worst ally he could ever find: a beautiful prostitute gunning for revenge. Hughes, happily, has had the good sense to hire epicurean lawyer Tubby Dubonnet, whose laconic air is belied by his zeal to protect his clients. And what a web they’re ensnared in!